a program designed to bring you up to date on the interpretation of symbols and elemental geomancy. This program comprises four sessions. Each session is a milestone on the journey to mastery of this skill. Divination is an effective tool for tackling the crisis of the human psyche in modern time. Divination clarifies the meaning of the soul’s quest and shed light to the obstacles to overcome on the way to successful living. In other word, divination does not just tell you what is going on in your life; it tells you what you need to do in order to flow into your gifts and fulfill your purpose. Divination provide a positive spin on human challenges by emphasizing gifts and purpose. Welcome to this yearlong divination certification training, a program designed to bring you up to date on the interpretation of symbols and elemental geomancy. This program comprises four sessions. Each session is a milestone on the journey to mastery of this skill. SESSION 1: Understanding the elementals. We will study the cosmology under which this type of cowry shell divination operates. We will identify all the symbols pertinent to interpretation, and select our spirit shells to work with. We will also make the divination cloth, the piece of fabric that will serve as the support for spreading the elements that speak the hidden message. During our time together, we will ritually connect deeply with the Medicine of the Earth and affirm our deep rootedness in this powerful healing work. SESSION 2: Understanding the symbol and its position on the cloth. This will be the first opportunity to extract meaning based on global positioning. The actual divining step is in effect when we know what a symbol says on the basis of where it is. In this session we will do map out a many interpretive direction as time allows and perform the first collective divination. During our time together, we will ritually connect with the Medicine of the Water and cleanse away all that is no longer of service to us with respect to our purpose and the gift that we are here to deliver. SESSION 3: The art of prescription. Divination and ritual healing. Upon verification that we have mastered the art of telling what anything in the spread means, we will dive into the big challenge of what to do in order to improve, change, transmute or dissolve. This means, addressing issues that have become clear with a corresponding ritual initiatives. Divination is not fulfilled unless there is a way to deal with the discovery that divination made possible. During our time together, we will ritually connect with the Medicine of the Fire and connect ever deeper with the Ancestors and the Otherworld whose support with guide us forward on this journey. SESSION 4: This session will be when we must implore the ancestors and all spirit allies to walk with us from here on, as we go into the world to offer divination. We will ritualistically consecrate the tools of divination. We will discuss the relationship between the environment and the issues brought to divination. The vibration of the environment where people live comes with its own challenges. Therefore in different areas, people exhibit different symptoms. **Each onsite session will include an experiential indigenous radical ritual for the future diviner. 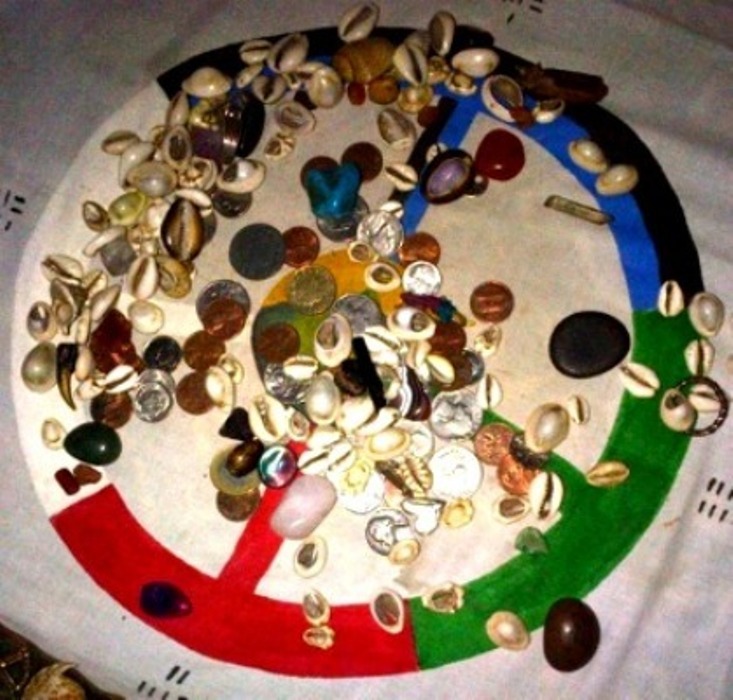 This provides personal experience with healing through african spirit technologies which, in effect, will deepen the cowry shell diviner’s ability to confidently prescribe certain healing prescriptions during the divining process. Lodging & Meals: Price is based on your preference for Lodging & Meals. Options for lodging include camping onsite, twin size blow up beds indoors, or private rooms indoors with “real” beds. You may enjoy the meals that are prepared onsite or bring your own food along. **In addition, there will be 4 one-hour “live” webinars with Elder Malidoma between the onsite sessions and homework/practice sessions between sessions.